Look at the woman in the middle. What do you think she is holding in her left hand? These three women are holding a snail shell in their left hands, and it contains rice seeds. They are planting rice seeds on the farm, which is a traditional rice-planting method in this community. Traditionally, rice-planting is a woman’s responsibility. They hold a snail shell containing rice seeds in their left hands, and a dibbling hoe in their right hands. 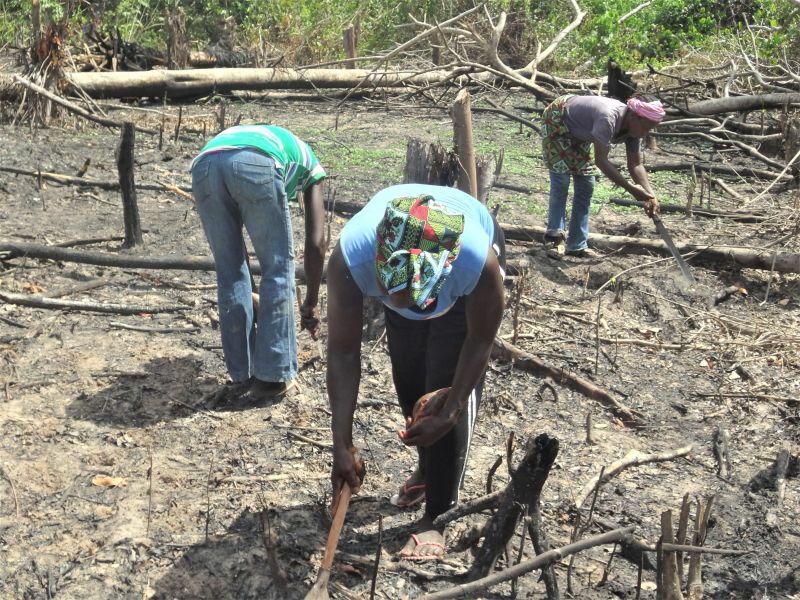 Tilling the land with the hoe, they plant rice seeds in the ground. This planting method is believed to bring a good harvest. Look at this photo! What do you think this man is doing? What is he holding in his left hand? 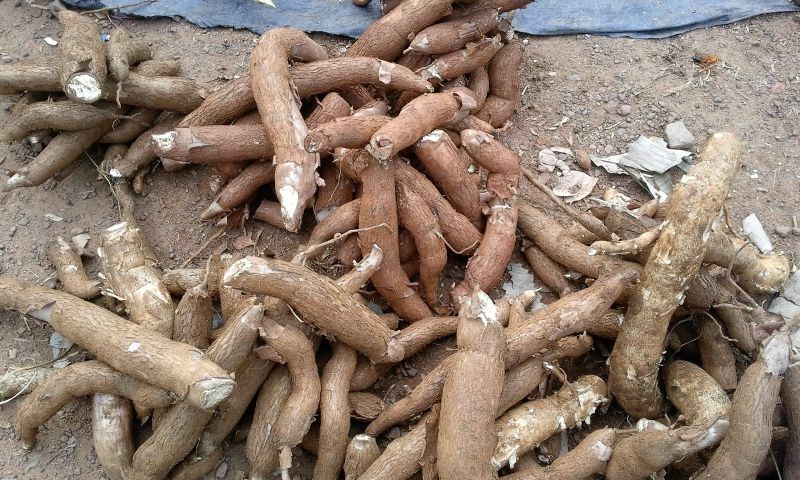 This is cassava that has just been harvested. How would you carry the cassava from the farm back home? 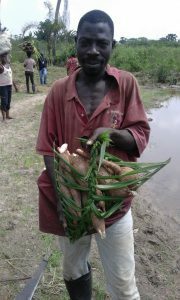 This man is carrying the cassava with a basket that he made. What do you think the basket is made of? It is made of palm fronds, which are “beary” strong. 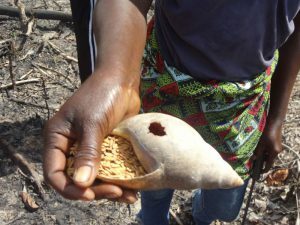 A snail shell is used as a container for rice seeds. 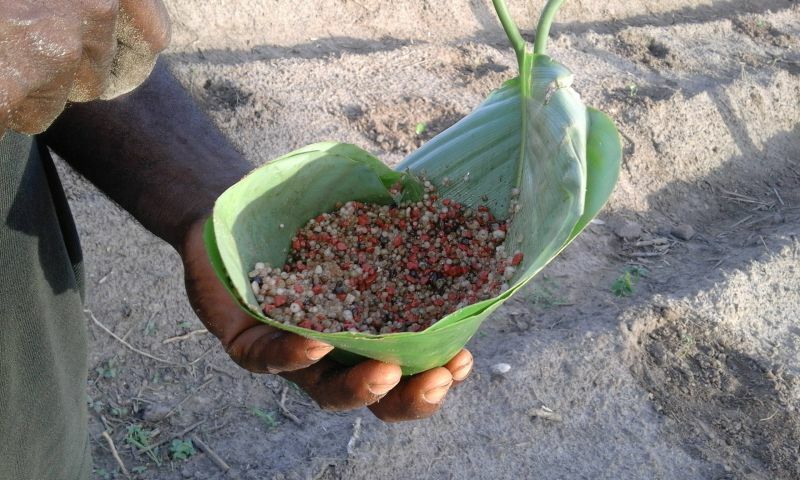 Leaves are used to carry fertilizer. Palm fronds are used to make a basket to carry cassava. Without plastic containers, cloth bags, or carton boxes, they can perform their agricultural work. 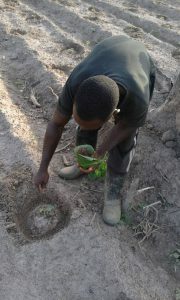 How creative Liberian farmers are! As the proverb says, necessity is really the mother of invention. Be Empowered with Available Resources. Let’s BEAR!